We met… In secondary school when we were 13! We were in a few of the same classes and were friends but it took until the end of 6th year for Steven to pluck up the courage to ask me to go on a date! Our proposal… Happened in our sitting room! We had moved into our new home on our 9 year anniversary and Steven proposed a few weeks later. We were watching Impractical Jokers on TV one Sunday evening. I was in my pyjamas, no makeup on, hair not straightened and Steven showed me a box of things he had brought from his house from our trip to America a few years previously. He went through all the little bits and pieces he’d bought and then told me to look inside the box because there was one more thing in it. Sitting inside was a beautiful ‘Me to You’ figurine with a ‘Will you marry me?’ message on it. It was the perfect proposal as Steven always buys me ‘Me to You’ figurines for special occasions. We went shopping the next day and I chose my perfect ring! Our ceremony… We opted for a Humanist Ceremony and it was performed by the lovely Philip Byers. We made it very personal with songs and readings by family and friends. 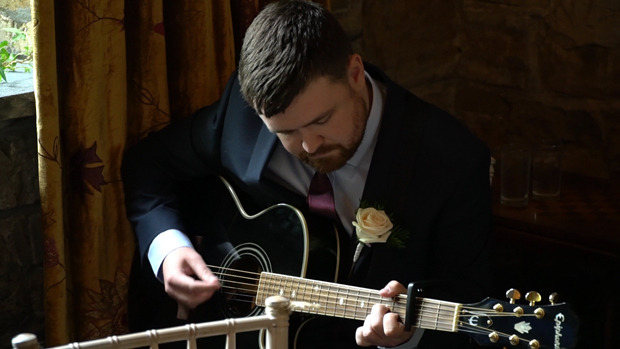 My brother played ‘Everlong’ for me as I walked up the aisle my best friend Jenny sang ‘Make you feel my love’ as we signed the register. We had a hand-fasting ceremony which was a beautiful touch and was a big hit with our guests! My dress… was the exact opposite to what I thought I wanted! I found my dress in the seventh shop I went to and it was the 60 somethingth dress I tried on! It’s a Phil Collins dress and I chose the grey belt with ivory flowers to make it unique for me. I also got small capped sleeves put on it using the lace from my veil. 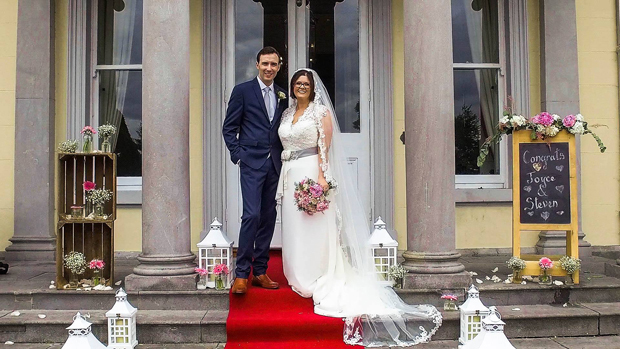 I got my dress and veil from The Bridal Corner in Glasnevin. My hair and makeup… I’m incredibly lucky to have a makeup artist for a sister so my sister Nicola did my makeup. It was absolutely perfect and she made my eyes ‘pop’ which was exactly what I wanted. I did my own hair as I always wear it down and straightened. 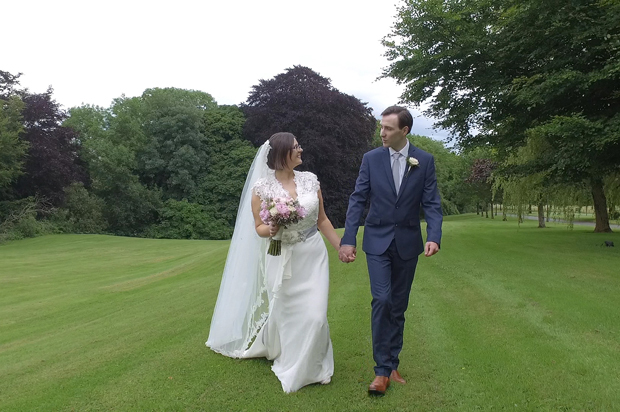 It was very important for me to look like myself on my wedding day so by having someone who knows me so well do my makeup and by doing my own hair, I definitely achieved that. His suit… Was a lovely, slim fit blue suit with a subtle lined design. He got it from Marks and Spencer. Our wedding theme/colours… We wanted our wedding to be a relaxed day with elements that represented us. We went with a vintage and floral theme with burlap cones, cutlery holders and our jars were also decorated with floral burlap wrap. 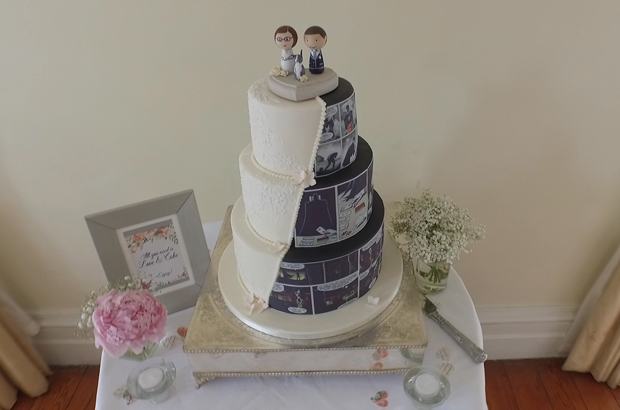 We also included fun elements such as our wedding cake which was a half and half style. My half was lace and floral while Steven chose his favourite Batman comic strip for his half. Our cake topper was hand-painted by my sister and had us and our dog Milo on it. We also named our tables after our animals and had photos of them on each table. 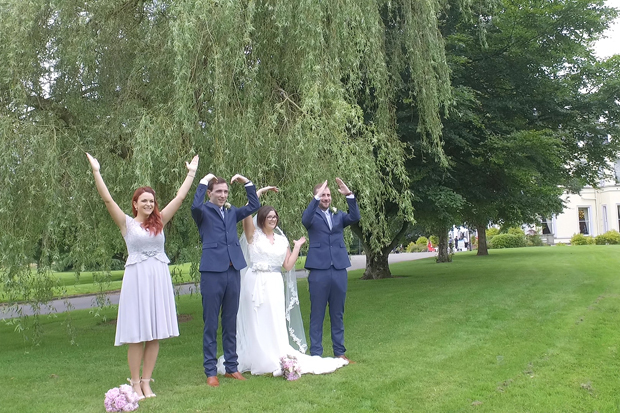 What our bridal party wore… My bridesmaid wore a gorgeous Jenny Packham dress from Debenhams. It complemented my dress perfectly as it was lace on top with a chiffon skirt. Our Best Man wore the same suit as Steven from Marks and Spencer. 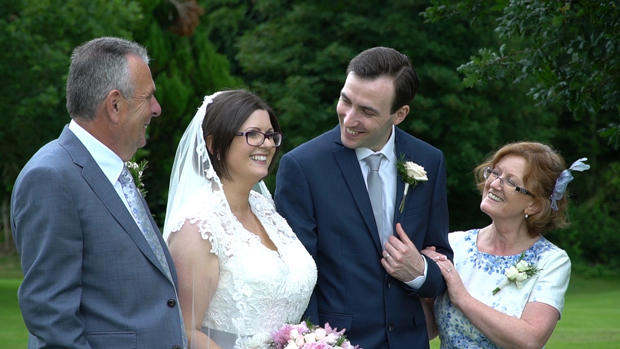 We chose our videographer because… Clint’s work (Your Wedding Video) speaks for itself! We saw his videos online and loved how he captured every tiny detail of the day. Maeve was an absolute pleasure to deal with and was so quick to respond to any emails. On the day, Clint was an absolute gentleman. Himself and our photographer, Phil Voon from Give Us a Goo Photography worked so well together and captured such amazing memories for us! 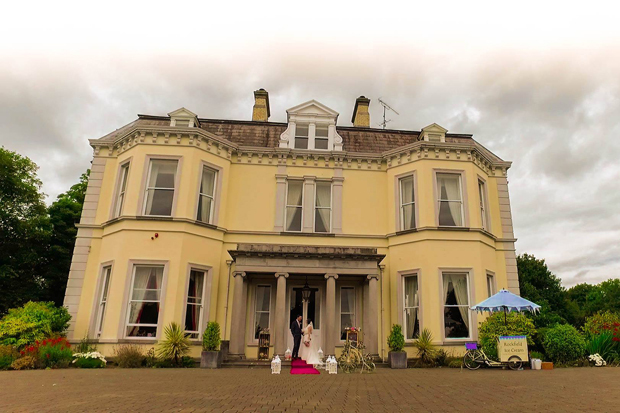 We chose our venue Moyvalley Hotel & Balyna House because… it was my absolute dream venue! I visited one rainy Thursday in September 2015 with my sister, as Steven was working, and the minute I walked into the reception room in Balyna House I welled up. It was just so beautiful and homely. I brought Steven down to see it the following weekend. 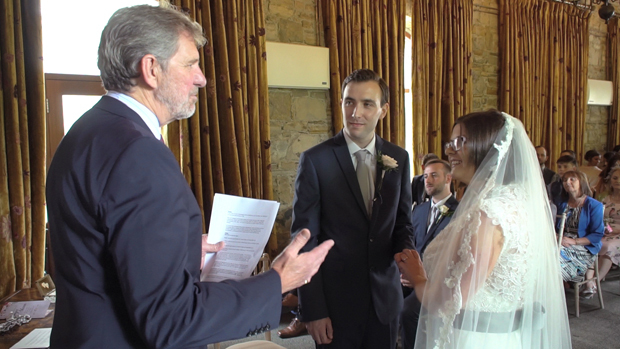 We loved the fact that we could have our ceremony in the Stone House followed by our reception just a few feet away in Balyna House. The fact that the house was exclusively ours for the day and night was fantastic as well. Orla, our co-ordinator, is an absolute asset to Moyvalley. She made our day absolutely perfect from start to finish and was so easy to work with. 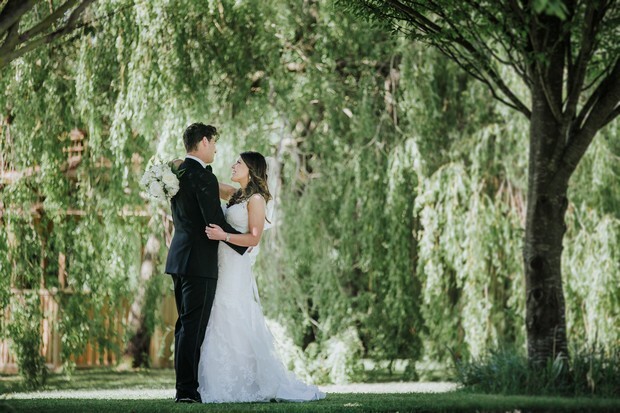 My favourite part of the wedding day… Was seeing all of our hard work paying off and having the wedding of our dreams. 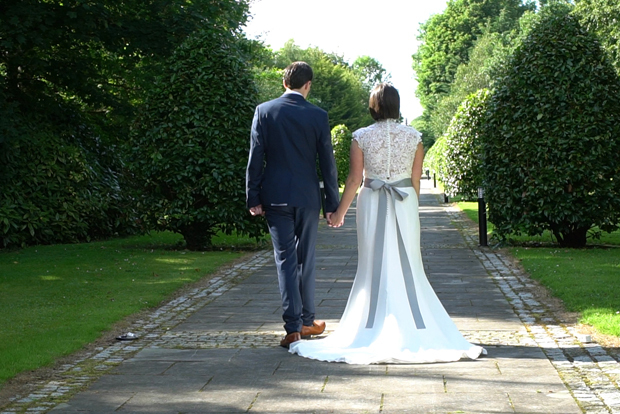 Everything from start to finish was perfect and we honestly wouldn’t change a thing! My piece of advice for other couples… If you want it, buy it or book it!! There were so many things we didn’t have to have but that we wanted and they are the things that made our day unique and special. We wanted our guests to experience the things that we like and enjoy so if we liked it, we got it and we have absolutely no regrets.